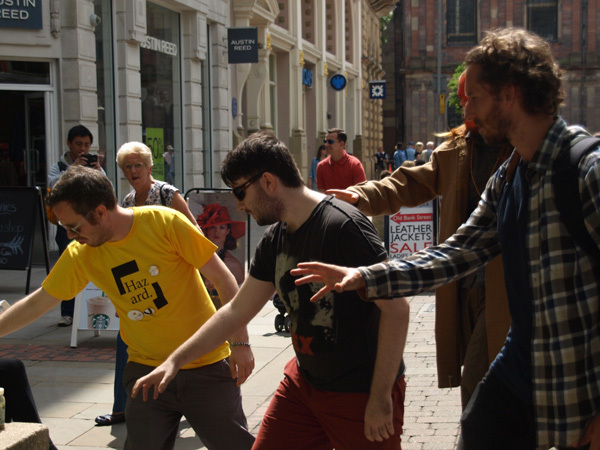 Many people are aware of the popularity of the flashmob, which emerged in recent years as a fun collective take-over of public space, usually involving a choreographed routine in which a group of people suddenly break-out of the routine order of public space and perform their dance or movement, surprising and delighting ordinary occupiers of the space. This cultural form has since been co-opted by big business, as a fun form of guerilla marketing. Stephen Donnelly’s Drift Mob borrows from this phenomenon and nods to the Situationist practice of the dérive, which discouraged a rational, consumerist navigation of the city in favour of wandering and drifting, much like Baudelaire’s ‘Flâneur’. 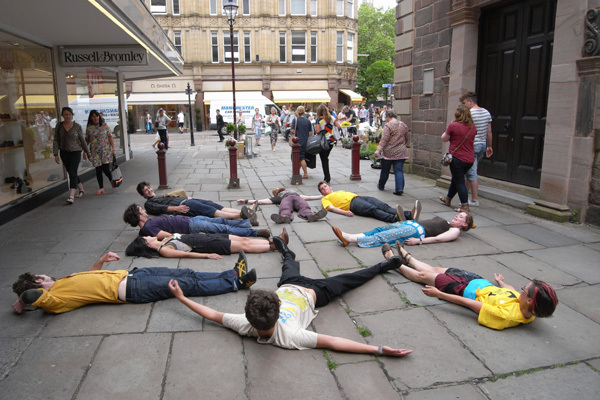 Throughout the day at Hazard, Donnelly led groups of people to create his drift mobs. 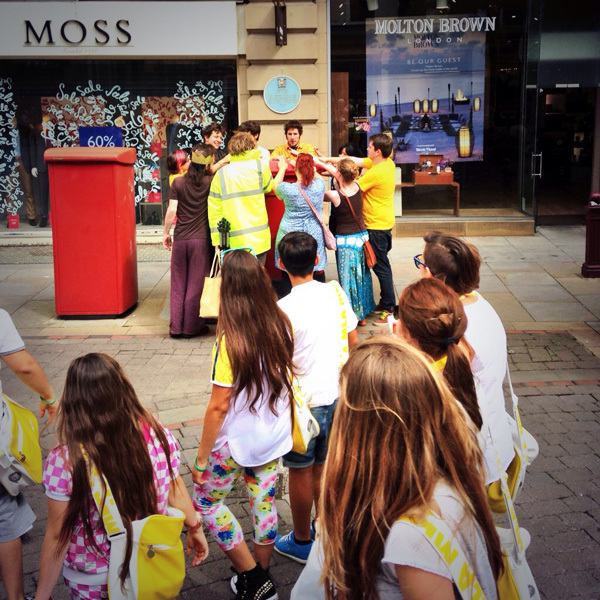 The group was put into an order so that each person involved was given the opportunity to lead the rest of the group. The rules were that the group could choose to either follow the leader or simply watch and support the rest of the group in performing an action. When a leader wanted to pass on the reins to someone else, they would squeeze the next person’s shoulder as a signal that they should take over. The performance introduced a level of one-upmanship, as we tried to think of ways to take the group through ever more creative actions, or to tire people out. But, there was always the option not to partake. In reality, the group offered a certain freedom and security, spurring everyone to perform actions they would never think of performing at another time. It felt very rebellious, playful and exciting. For me, the most wonderful moments were when we came up with actions that related closely to the site – playing air guitar along to the musician next to the war memorial, making a temporary hand-print painting with fountain water, and climbing underneath and over stone benches. The people-watchers sat at Starbucks, or on benches in St. Ann’s Square treated us as a comedic spectacle, whilst the managers of Office and Barclay’s Bank, whose shops we briefly occupied, treated us as unwanteds. 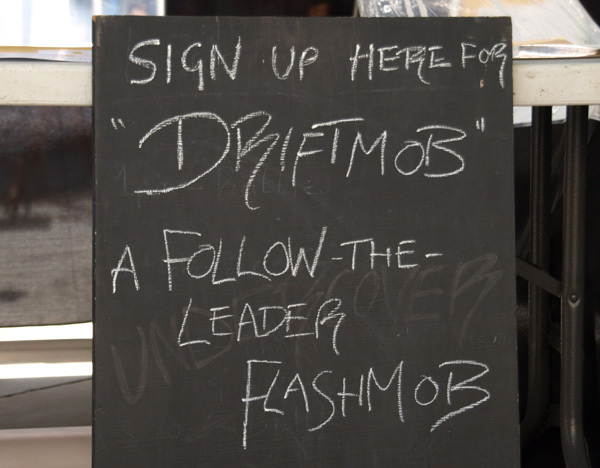 The drift mob is a wonderfully ridiculous and unpredictable organism, which has the potential to make beautiful connections within the site, to expand the narrow range of movement and action expected in public spaces, and to disrupt commercial space with a drift of play.